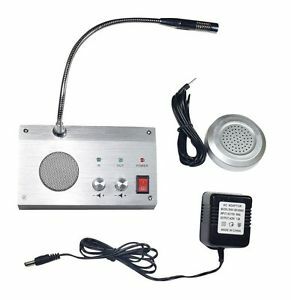 This 5CORE® Counter Interaction Microphone (120x84x43) mm is compact, powerful, and professional two-way communication system with silver-colored table top attendant unit, gooseneck microphone, and separate talk/listen control functions, recording jack and toggle power switch. Easy to install, user-friendly, apt to use by professionals two-way communication system. Compact table top attendant unit with gooseneck microphone rendering high-flexibility. Power switch provided for switching between On/Off feature through a toggle switch.